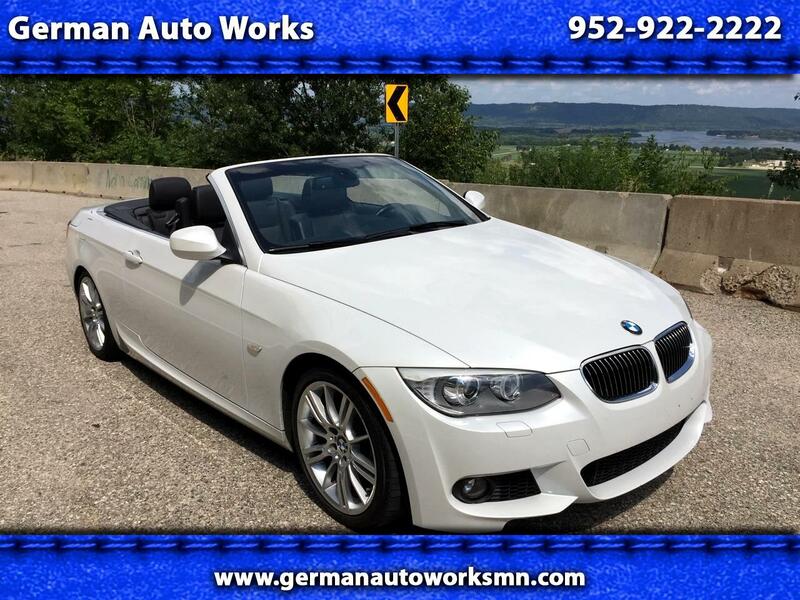 BEAUTIFUL BMW 335 M SPORT CONVERTIBLE. THIS BMW IS FINISHED IN MINERAL WHITE OVER BLACK LEATHER SPORTS SEATS AND IT IS IN EXCELLENT CONDITION. IT IS LOADED WITH OPTIONS AND HAS A GREAT HISTORY AND HAS BEEN STORED WINTERS. COMES COMPLETE WITH ALL BOOKS, KEYS, WIND DEFLECTOR, CAR COVER, TRICKLE CHARGER AND MUCH MORE. CAR WAS JUST SERVICED AND HAS A CLEAN CARFAX AND AUTOCHECK. PLEASE CONTACT SALES FOR AN APPOINTMENT TO SEE THIS BEAUTY. WE ACCEPT TRADES AND OFFER FINANCING AND EXTENDED WARRANTIES AND SHIPPING OPTIONS. YOU CAN REACH US ANYTIME VIA PHONE OR TEXT AT 952-922-2222 OR ON OUR WEBSITE AT WWW.GERMANAUTOWORKS.COM.